Winx will look to equal the legendary Black Caviar's record of 25 consecutive wins when she competes on Day 2 of The Championships at Sydney's Royal Randwick racecourse this Friday night. To achieve the milestone, Winx needs to win the G1 Longines Queen Elizabeth Stakes, Sydney's richest race of the autumn, which is scheduled for 3:05 p.m. Sydney time on Saturday, April 14th (1:05 a.m. EDT, or 10:05 p.m. PDT on Friday, April 13th). A win would cement Winx's place as the greatest Australian horse of the modern era, joining the ranks of not only Black Caviar but also Makybe Diva and Kingston Town. Winx has earned the distinction with a golden run that stretches back to the Group 1 Queensland Oaks in 2015. She has since won 24 successive races, comprising 17 Group 1 flat-race victories (the Queen Elizabeth would make 18), including three straight Cox Plate titles. This means that she is now a confirmed Group 1 record holder in Australia as well as the world-record holder for Group/Grade 1 victories on the flat, surpassing US-runner John Henry. TVG will be broadcasting live trackside for all of Friday's races, with updated betting information delivered by broadcasters Mike Joyce and Sky Racing World's Jason Witham. In addition to the G1 Queen Elizabeth, they will also provide coverage of the G1 Schweppes Sydney Cup, headlined by 2018 Tancred Stakes winner Almandin; the G1 ATC Australian Oaks; and the G1 Coolmore Legacy, the winner of which receives an automatic berth in the Breeders' Cup Filly & Mare Turf (G1T). Three Group 2 fixtures will complete the night's race card – the Percy Sykes Stakes, Royal Sovereign Stakes and Sapphire Stakes. Last week's G1 Star Doncaster Mile added to the hype for the Queen Elizabeth as fans were treated to a memorable race when Happy Clapper overcame the heavily-backed Kementari in a record of 1m 33.17s. That has the stage set for a showdown between Winx and Happy Clapper – Australia's two favorite racehorses – this Friday evening. Friday night also features a rematch of the 2017 Cox Plate in which Winx edged Humidor, now second-favorite in the Queen Elizabeth at 10/1, by half a length. Happy Clapper, tied with Gailo Chop as third-favorite at 12/1, has finished behind Winx five times, including a recent 0.8 length second in the George Ryder Stakes. Happy Clapper boosted his chances of turning the tables on Winx (now the 9/50 favorite) when earlier this week, the champion mare drew the outside barrier, gate ten. Happy Clapper came up with gate nine while Humidor and Gailo Chop got barrier one and five, respectively. Hugh Bowman, the world's best jockey, will once again team up with Winx. Kerrin McEvoy will mount Happy Clapper, as regular rider Blake Shinn will be aboard Humidor. “They (Happy Clapper and Winx) are both ready to go. 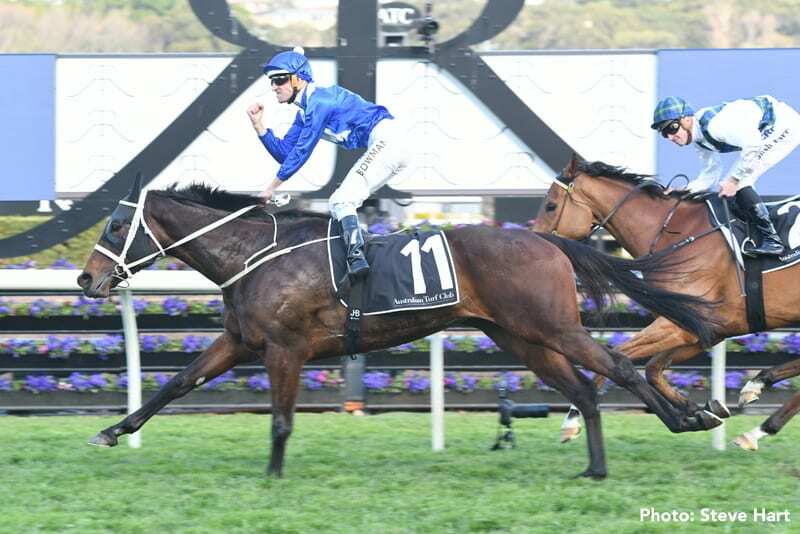 Winx is a champion, up there with the best we will ever see, and it's just about impossible to beat her but what do they say, you can't win it if you are not in it,'' said Happy Clapper trainer Pat Webster. Almandin currently holds the advantage in the A$2million/US$1.5 Million G1 Sydney Cup, the sister race to the Melbourne Cup, after sealing an outstanding win in the Tancred Stakes. He will set out from barrier five as the 3/1 odds-on chance. Almandin will attempt to lead his part-owner Lloyd Williams to a fifth win in the Sydney Cup, with his stable mate Aloft, from gate 13, chasing him home as the second favorite at 7/1. Who Shot Thebarman (12/1) will also be another to watch as he competes is his fifth Sydney Cup at 3:45 p.m. Sydney time on Saturday, April 14th (1:45 a.m. EDT, or 10:45 p.m. PDT on Friday, April 13th). Chris Waller also has a runner in the A$1 Million/US$773 000 G1 ATC Australian Oaks, which takes place at 2:25pm Sydney time on Saturday, April 14th (12:25 a.m. EDT, or 9:25 p.m. PDT on Friday, April 13th). The race's 5/2 favorite Unforgotten, winner of the G2 Phar Lap Stakes and runner-up in the G1 Vinery Stud Stakes, will be trailed by the Kiwis, who have a historically excellent record in the Oaks. Luvaluva (18/5), Aloisia (5/1), Hiyaam (6/1) and Savvy Coup (7/1) will defend the title for New Zealand. With clashes in this year's G1 Coolmore Classic and Group 2 Emancipation Stakes, Daysee Doom and Dixie Blossoms have now competed against each other in eight career races. The duo now takes their rivalry to the A$1 Million/US$773 000 G1 Coolmore Legacy. Dixie Blossoms will start as the 4/1 favorite with Daysee Doom sitting second in the line of betting at 6/1. Both mares will face very quality opponent in Emancipation Stakes fourth runner Foxplay, lurking in third place at 7/1. The Coolmore Legacy is set for 4:25pm Sydney time on Saturday, April 14th (2:25 a.m. EDT, or 11:25 p.m. PDT on Friday, April 13th). Aside from TVG's live broadcast, The Championships Day can be streamed live via ADWs such as TVG, TwinSpires, Xpressbet, NYRA Bets, WatchandWager, HPIbet, AmWager, and BetAmerica. Free expert picks and past performances available at Sky Racing World. A former Managing Director of Sportech Racing, David was appointed President and CEO of Sky Racing World in April 2014. The Louisville, Kentucky-based company, a subsidiary of Australian wagering firm Tabcorp, provides Australian, New Zealand, South African and South American racing content for simulcast horse-race wagering to multiple North America-facing ADW brands and race-tracks. This entry was posted in Horseplayers, NL List and tagged Almandin, Australian racing, Black Caviar, David Haslett, happy clapper, sky racing world, The Championships, winx by David Haslett. Bookmark the permalink.